The Crossroads family believes that Christianity is foremost about practicing the ways of Jesus which embodied the unconditional love of God, offered an unlimited welcome to everyone and helped people to live with an unwavering hope of transformation. 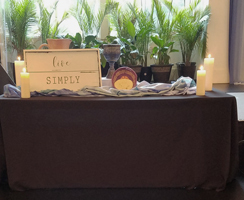 Our mission is to provide practical resources that help us to live our daily lives in the ways of Jesus’ compassion, forgiveness, service and wisdom. Imagine a world in which every person, family, community, nation and world experienced compassion, forgiveness, service and wisdom in their daily lives. Jesus not only imagined such a world, he gave his life for it and called others to follow and do the same. We take Jesus’ invitation seriously. That is why we offer the same radical hospitality that he did. We welcome all persons without regard to race, age, gender, sexual orientation, or physical abilities. In our eyes everyone is sacred and is a member of God’s family. To hear the Crossroads Sunday Message Podcast - Subscribe at iTunes - Crossroads Ashburn. Click here for the Sunday Messages. Crossroads Kids for Infants through 5th grade meets at 10 AM on Sundays. A welcoming program using activities, Bible stories and crafts to bring it to life for children. For Middle School and High School students Sunday AM Intersect meets weekly at 10 AM. Adult small groups provide opportunities for people to gather together and spend time in deeper connection in community.